Welcome to my trip report on Garuda Indonesia! My original plan was to fly on Garuda's Boeing 777-300ER on GA412 which was scheduled a month before the date of departure. That was my first choice in fact, however when I checked again just 2 weeks before my date of departure, the Boeing 777-300ER was no longer scheduled to fly on this route and the only wide bodies were either A330-200 or A330-300.Then I switched my attention to Citilink's A320 since it was a new airline for me, I was more keen in fact. However, when I checked the air fare, I wasn't impressed because there were too many add-ons and the total price was unattractive. It was then I discovered Garuda was having a sale during that period and checking the price, it was only S$5 more expensive. 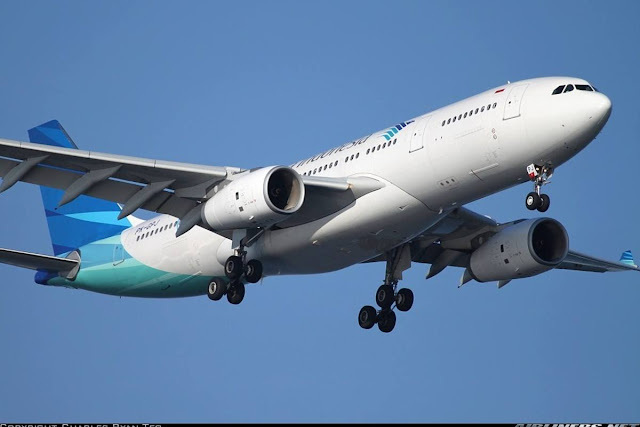 No need to think any further, I booked with Garuda and chose the GA406 which was an earlier flight - to be operated by Airbus A330-200. For a 2 hours flight for S$70 on a wide-body, I am not complaining. For discounted airfare, choosing of seats is not allowed until check-in time (24 hours before the flight). I had booked with the Grandmas hotel just newly opened. Its at Jalan Sriwijaya and its pretty decent, would certainly recommend that hotel to anyone who is there. Paid only S$40 for a night. Time to select my seat! Completed my check-in, fingers crossed that my seat would remain vacant for the flight. Checking what aircraft I was flying on, PK-GPJ one of the oldest Airbus A330-200 in the fleet was to take me there. This aircraft, I did a check later on was supposed to be for Hainan Airlines, however this airline didn't take delivery of this aircraft. Arriving at the airport early, I made my way to the check-in counter. Did my check-in here and it was fast. Within minutes, I was at the air side. Checking the gate that I should be heading to. Do you like this interior? Once the boarding time came, I made my way to the gate. There is free wifi at every part of the airport! My ride in sight. Not a photography-friendly airport for aircraft photography. 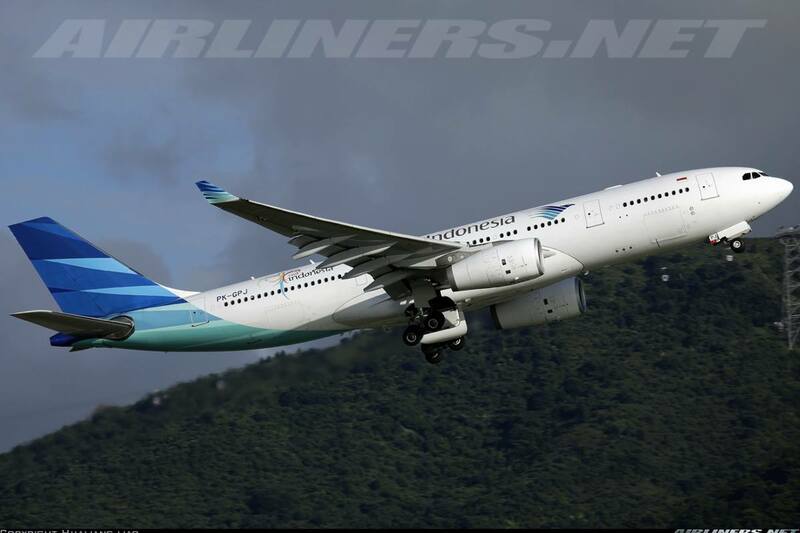 The beautiful Airbus A330 was waiting for her next assignment! Beautiful, right? Credit to the respective photographers. Boarding the aircraft was in order and it was a fast boarding process. Didn't take long for everyone to settle down and the door to be closed in no time for departure. I had a dilemma when choosing the seats. Initially I wanted the front row seat but because I expected this to be probably 80% full flight, I decided to move near to the rear. Hoping that there would be some empty seats at the last cabin but I was wrong later on. The flight turned out to be 100% full at least in Y class. I did a walk around on the plane later on during the flight and every seat was occupied. A businessman around my age sat beside me and fortunately he was pretty cool about me with all the photos and video (take-off and landing) that I did. That's important for me. Anyway, plane pushed back pretty much on time, and we taxied to runway 25R for a quick take off to Bali! Once the seat belt sign was off, it was time to take some photos of the cabin! J class seat looks comfortable! It was disappointing not to see the USB port. The legroom space was normal for A330. The cabin shot of Y class cabin. It's great to have a cabin crew smiling for my photo! This cabin interior is the standard with the exception of the CRJ1000 and ATR72-600. That's the PTV Box which can be an inconvenient especially when you want to stretch your legs. Had 2 windows for myself. It was my 2nd time riding on this seat, my previous time was on the airline's Boeing 737-800 and my opinion on these seats remain the same; I don't find the seat comfortable especially the cushion for your back. I prefer leather seats, the ones you see on most Low Cost Carriers. The seat pitch is reasonable but the colour of the seats to be honest is not to my liking. Modern toilet, looks pretty decent. The crew on board my flight were friendly and there were certainly smiles on their faces, the Indonesia hospitality kicked off from the step of the door to the time when we said farewell! I was very much impressed with the crew whom I got served by and they were pretty cool about me taking photos. This airline may not have the best hardware, but the in-flight service was top notch! No complaints at all, in fact this is how flying should be like. Whatever class, status or race one is, one should be treated with respect at all times! Before departure, the cabin crew offered some sweets for us, I thought that was a very nice touch! Not too long during the flight, the cabin crew came and served us our meal for this 2 hours short flight. This is what I had. I had a choice between Chicken noodles or Beef Rice (Indonesian style), I decided to go for the latter. It turned out to be a good choice. Quite delicious for an in-flight meal! I finished my meal very quickly as I was famished at that moment. Once that was over, it was time to explore the PTV system and one observation I made was no in-flight map and how can you not have one? The rest of the features were in the system. This IFE system is actually built for Hainan Airlines and I can understand that Garuda has its own IFE system which I was told is better than this one. I guess that's why this aircraft and a few other Hainan's "rejected" A330s do mainly domestic flights. Every passenger was offered this head seat. The sound quality is average. Look at how long the Boeing 777-300ER is. Can you spot the retro livery? The take-off was slightly bumpy. We were cleared of the dull weather! The 2 hours flight went past quick and soon we were on final approach to Denpasar, Bali. We landed smoothly and taxied to a remote parking lot. Once the aircraft reached its parking position, we were to get off by the old way, the staircases to the tarmac which lead us to the domestic arrival hall. While doing that, I managed to take some of these photos. The popular Roll Royce Trent 700 engine. Thank you, PK-GPJ for the wonderful ride! Another positive experience with this airline. 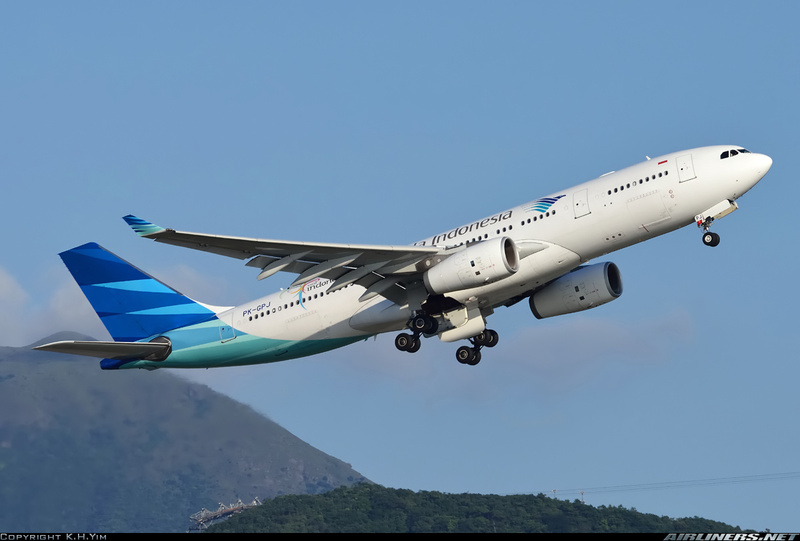 I have not flown on the old Garuda, but I was told that this was a much improved carrier that seem very interested to compete with the biggest carriers. I was sceptical with the carrier initially but was won over by the airline after seeing lots of photos and positive trip reports of this airline. Had my first flight with this airline in 2011, unfortunately I didn't do the trip report as I had accidentally deleted the photos by mistake. Overall, I had a good experience with the airline but my both flights (CRJ1000) and this one had certainly impressed me even more. So would I fly with this airline again? Of course and I definitely recommend this airline to anyone - both short and long haul routes. You can certainly trust its reliability. Thank you for reading this trip report. Stay tuned for more! Hi Charles this is a weird question, but seeing as you are so experienced in airline reviewing, can you please kindly tell me if there was a crack in the seat in front of you (in economy class) which you can slide your hand inside to reach the other side? Hi James, thanks for your reply. There is no crack at all, that is in fact the adjustable head rest.